A theatre group in Germany has come under fire for allowing a white actor to paint his face and take the part of a black character on stage. The technique - known as blackface - has been used by the Schlosspark Theatre in Berlin for its latest production, I'm not Rappaport. Critics have likened the move to minstrel shows in the US, which traditionally lampooned black people. But the theatre group has vehemently denied claims of racism. The play is set in New York and depicts the friendship of two elderly men - African-American Midge Carter and Jewish Nat Moyer. Director Thomas Schendel said they had been unable to find the right elderly black actor to play the role of Midge Carter so had opted for blacking-up 76-year-old white actor Joachim Bliese. "Many older black actors come from the music industry, and that wasn't a fit for the play as it wasn't a musical," he told The Local newspaper. 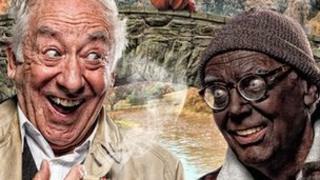 "When we couldn't find an elderly black actor who fit the role and could speak with a perfect German accent, we opted for blackface make-up." He said he was saddened by the controversy: "I tried to make a play about racism and ended up being called a racist". But his comments were dismissed by the advocacy group, Initiative for Black Germans. "There are more than enough black actors in Germany, especially in Berlin. Schendel is making excuses," said spokesman Tahir Della. Although there is no history of minstrel shows in Germany, Mr Schendel says "blackface is part of a theatre tradition" in Germany. And one member of staff at the 90-year-old Schlosspark Theatre told the BBC that in the 40 times I'm not Rappaport had been staged since 1987, a blacked-up actor had often been used - with no complaints. However, groups representing Germany's black population, which numbers around 500,000, have accused some Germans of insensitivity over the issue of race in the past, the BBC's John McManus reports. In September, a satirical comedian appeared blacked-up on a billboard poster as US President Barack Obama. In 2009, Dresden Zoo had to apologise after naming a small baboon after Mr Obama.